Feb. 2019: Elektronite has released Kai Magazine's Ninja Odyssey! Order the loose cartridge and ROM here today at naberhood games! Feb. 2019: A new release of the LTO Flash! User Interface Software here. Check the 'Beta' section. Includes firmware update, new jzintv and more! Feb. 2019: Elektronite announces a new, initially cart-and-ROM-only title from Kai Magazine: Ninja Odyssey! Should sales warrant, box, manual and overlays will follow in the future! Jan. 2019: RIP Professor Lorenz. We need more like you. Jan. 2019: New, new old stock copies of Slap Shot: Super Pro Hockey are available at the Blue Sky Rangers Store! Go fetch a copy. You know you want that sweet new box and overlays! Dec. 2018: The winning entry from the IntyBASIC Programming Contest 2018, Deep Zone, programmed and re-tuned for final release by Atrtrag, tested and brought to release by Intellivision Revolution, is available for order at the Intellivision Revolution Store, shipping in January 2019! Dec. 2018: The Intellivisionaries Podcast Christmas Special Edition 10 (a.k.a. The IP Holiday Special) is released! Dec. 2018: David Rolfe's Steamroller is for sale at Naberhood Games. You should buy it! Dec. 2018: Moonsweeper and Mad Bomber from Collectorvision have shipped! Find them here. Nov. 2018: The Intellivisionaries Podcast Special Edition 9 - PRGE Wrapup is here - give it a listen! Which feature should be added to LTO Flash! UI Software first? Download the LTO Flash! User Interface Software here, as well as links to documentation. Game reviews, variants, Easter eggs and other info appear here. Initial effort brings Gosub to the Intellivision! Bandai released a subset of the original Mattel titles in Japan, as well as the console. Blah Blah Woof Woof (BBWW) Music and Media published its first title at PRGE 2015 under the ©®@P™ label. European-market releases of Coleco's games. Active homebrew publisher for several platforms entered the Intellivision market in 2014. Digiplay/Digimed repackaged and rereleased Intellivision games from Mattel, Activision, and Imagic in Brazil. Best materials are to be found here. Founded in 2005, Elektronite's mission is to establish a thriving Intellivision cartridge market with top-notch materials and high-profile titles. Once you compare Intellivision Desert Bus to the Atari version, you'll know which platform provides the ultimate in bus simulators! Repackaged versions of various Intellivision games from Brazil. Founded in 2004, Intelligentvision's mission was to bring previously unreleased titles to cartridge format. Happily, they also brought several new original titles along the way! Repackaged versions of original Mattel titles. This revolution will be intellivised. Great software and hardware for the Intellivision! Sears repackaged Mattel titles and released them under the Sears Tele-Games label. Creator of the IntelliCart cartridge emulator and its sequel, the CuttleCart 3. Test and diagnostic software. At least two notably different versions exist, though other variants have been found. INTV Corp. also re-released the Mattel test cartridge. Memorabilia, modern-era Intellivision software, and other miscellaneous mumbo-jumbo. Yeah, some of it's not software. Deal with it. This listing preserves packaging variations. An exhaustive list of software (released and not) can be found in the Intellivision FAQ Cartridge List. Many fellow Intellivision fans have contributed images to this site. (Sometimes unwittingly :) Where such contributions appear, credit is given. We had one of the earliest releases of the Intellivision consoles, an original 2609, because I remember distinctly that the picture on the box for Space Battle was wrong. I also believe that it had a blurb for U.S.A.C. Auto Racing - but that license must have fallen through. In any case, we played that Intellivision so much that by February of 1981 (we got it for Christmas in 1980) we had let the smoke out of it , and it stopped working. Sadly, the replacement we got for it doesn't work any more. Currently, the sound / controller chip is in one of my Sears Super Video Arcade units. One of the I/O ports has an internal short between two pins, affecting the left controller. I got my Intellivision System III back in 1986 or so - perhaps 1987, but lost the box and manual somewhere in my college years. I've picked up other things more recently (the last 7 years or so), and they all appear on my hardware page. 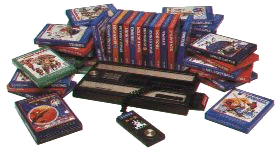 Click on this link to see my Intellivision hardware and add-ons collection. Click on this link for my listing of Intellivision console variations. The Overlays Thumbnail Page shows the principal Intellivision overlays in thumbnail images, with the requisite "click to enlarge" behavior. It also has links to further pages showing all the variations I have in my collection, and some that I don't. For the bandwidth-challenged, or those who would rather just see a text list, the Overlays Table Page may be better. Intellivision Forum on IntellivisionAge.com Lots of crazy characters and up-to-date discussion about all things Intellivision. Intellivision Revolution Revolutionika's news site, replete with a serial numbers database and a great deal of interesting information, the 125 Clubs, and more. Visit today! The Intellivisionaries The best podcast! Even more so if you love the best console of all time–Intellivision! jzIntv Joe Zbiciak's incredibly detailed technical site for programming, etc. - check out 4-Tris! The IntellivisionWorld.com Immense amount of great information and info on true rarities. The Intellivision Brasil In Portuguese, but some great content nonetheless. In case you didn't know, all electronic devices operate using smoke. You can prove this quite simply - if you let the smoke out of any electronic device, there is an incredibly high likelihood that it will no longer work. If it does still work, then there is still enough smoke left in it for it to continue operating.